What's so good about cotton? It's soft and comfy, and because it's natural cotton helps your baby's bottom breathe. But don't disposables prevent nappy rash? The best way to prevent nappy rash is by changing the baby frequently. Research shows that the massive growth of the disposables market has not delivered a corresponding fall in the incidence of nappy rash. But disposables keep the baby's bottom so dry, how can cotton compete? A baby is not uncomfortable in a moist nappy. It is only when the nappy is left on too long that it will make the skin sore. There are two big advantages to this feeling of moistness. Firstly the baby is learning the basic sensations which will help him/her to potty train. Secondly, the carer knows whether the baby is drinking enough – this is always important but it is crucial if your baby has a fever and is in danger of becoming dehydrated. Doesn't the bulkiness of cotton nappies restrict the baby's movement? 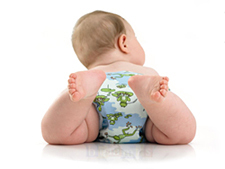 Modern cotton nappies don't restrict a baby's mobility in any way and actually support and protect the base of the spine. It is true that modern clothes tend to be designed for bottoms clad in disposables so you may have to buy the next size up of trousers and leggings. Is it true babies in cotton nappies potty train and are dry at night earlier? Infants potty train when they are ready – but that tends to be earlier in cotton.